In fantasy hockey, much like real life, goalies rule. Whether you do a points-based league or head to head category, having 2-3 superb goaltenders can be the difference between a league championship and a last place finish. Last season there were several surprises in between the pipes across the league, but two goalies, each on separate paths, rose to the top, and now the dilemma for the upcoming season begins: Semyon Varlamov or Ben Bishop? While researching and crunching the numbers, I have come to the conclusion that it’s too darn close to call, but let’s delve into the stats a bit further, should you find yourself in this spot during draft day. Those are the basic statistics. Once again, it’s a tight race between the enigmatic Russian (aren’t all Russian goalies enigmatic? ), and the 6’ 8” former Maine Black Bear. Let’s compare! Semyon Varlamov: As the undisputed starter in Colorado, Varlamov enjoyed by far his best statistical season in ’13-’14. If you watched the Avs on a consistent basis (a fun, speedy team), you’ll know that Varly’s Vezina Trophy runner-up and 4th place Hart Trophy finish were no fluke; he dominated more or less from start to finish (Olympics and Games 6 & 7 in the Cup Playoffs vs Minnesota notwithstanding). What you may/may not know is that, for Colorado to compete night in/night out, he had no choice. While crunching the numbers, I utilized the latest in advanced statistic, the CORSI Rating. Named after longtime Buffalo Sabres’ goaltending coach Jim Corsi, it essentially breaks down a team’s 5 on 5 play with possession of the puck relative to offensive zone time. In 2013-’14, the Avalanche played at a CORSI rating of 47.4%, which was good for 25th in the NHL. What’s that mean for Varlamov? Lots of defensive zone time for the Avs, which leads to more scoring chances against, which then leads to more shots on goal. Lots more shots on goal! Varlamov led all goaltenders with 2,013 shots faced, almost 200 more than the next tender (Kari Lehtonen). Varly was a busy, busy man, yet answered the bell with a .927 Saves %, ranking 3rd best in the league. Ben Bishop: The Denver, CO native enjoyed his breakout season in 2013-’14, as he finished 3rd in the Vezina Trophy voting, and set many franchise single-season records in the process. 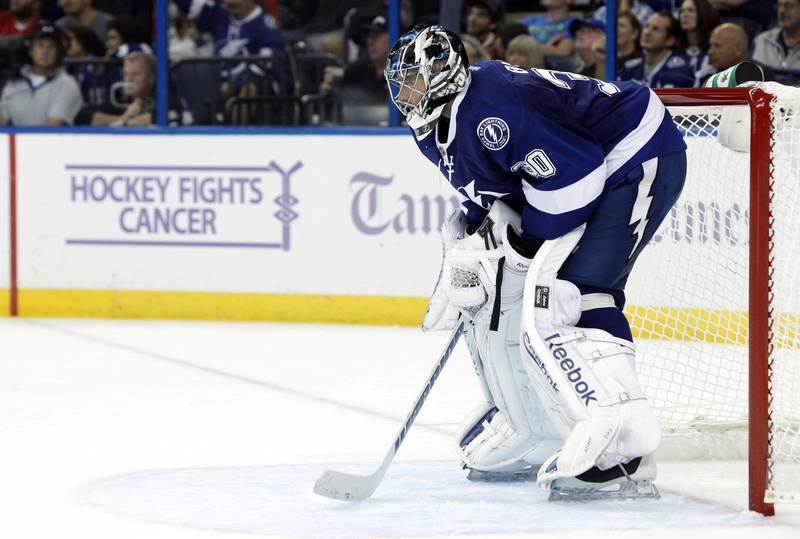 Bishop emerged as on the best netminders in the league, and showed just how valuable he was to the Lightning, as the team crumbled in the opening round of the playoffs when Bishop suffered a dislocated elbow. That injury coupled with offseason wrist surgery bears monitoring for the prudent fantasy owner. The opposite of Varlamov, Bishop faced 1,758 shots (9th in the league), and was the benefactor of a much more sound defensive team in front of him. Tampa’s CORSI rating of 51.5% ranked 10th in the NHL, and with the offseason additions of Jason Garrison and Anton Stralman on defense in addition to a full season of Ryan Callahan’s strong two-way play, the Bolts’ team defense should be even stronger in 14-15. At 27, Bishop is truly entering his “prime” as a starting goalie. Verdict: This is a tight, tight race, but I will give the slight edge to Bishop. Both goalies will be in the 2nd tier after Lundqvist, Quick, and Rask, but draft Bishop ahead of Varlamov; it seems a bit too unrealistic to expect Varlamov to repeat his 13-14 season and he does have a history of inconsistency. Having said all that, remember to monitor Bishop’s health going into camp.